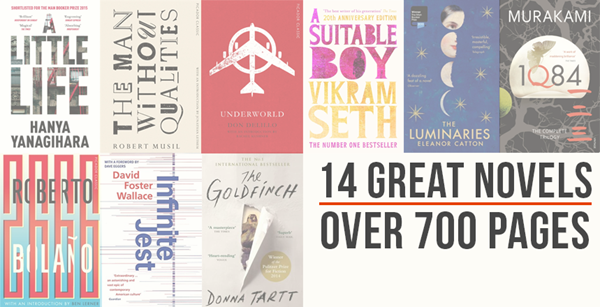 Fourteen very long novels that we can guarantee are worth the investment. Sometimes 600 pages just isn't enough. If you’re looking for a literary challenge for the New Year, or would just like a good excuse to spend the winter months curled up with a good book, here’s some very long novels (plus a few trilogies) that we can guarantee are worth the investment. Shortlisted for the Man Booker Prize, A Little Life is an immensely powerful and heartbreaking novel of brotherly love and the limits of human endurance. Essential reading. Available in Paperback, and as an Ebook and Audiobook. DeLillo offers a panoramic vision of America defined by the overarching conflict of the cold war in this masterful and awe-inspiring story of a search for meaning, survival and connection in the toughest of times. Available to buy now in Paperback and as an Ebook. Pulitzer Prize winning novel The Goldfinch is an odyssey through present-day America and a drama of enthralling power that combines unforgettably vivid characters with thrilling suspense. Lauded by many critics as the finest novel in English, Middlemarch provides a complex look at English provincial life at a crucial historical moment and contains an exploration of some of the most potent myths of Victorian literature. Considered a sensation on publication and hailed across the world as a masterpiece, 2666 is a terrifying and awe-inspiring classic novel that has come to define one of Latin America's greatest writers. Available now to buy as a Paperback or an Ebook. Cormac McCarthy’s award-winning, bestselling trio of novels chronicles the coming-of-age of two young men in the south west of America and stands as a fierce elegy for the American frontier. All the Pretty Horses, The Crossing and Cities of the Plain are beautiful and brutal stories filled with sorrow and humour. Available now in Paperback or as an Ebook. Touching on topics such as addiction, recovery, tennis and even Quebec separatism, Foster Wallace’s encyclopaedic bestseller is considered one of the best novels ever published. A spellbinding epic tale of ambition, anarchy, and absolute power set against the sprawling medieval canvas of twelfth-century England, The Pillars of the Earth is Ken Follett's classic historical masterpiece. Available now in Paperback, and as an Ebook and Audiobook. A masterpiece of realism and illuminated by irresistible characters, Anna Karenina is among the best-loved of all novels, penetrating to the heart of the ruling class in Tsarist Russia. Available now in Hardback and as an Ebook as part of the Macmillan Collector's Library. Set in 1913 surrounding the seventieth jubilee of the accession of Emperor Franz Josef in Austria, The Man Without Qualities is part satire, part visionary epic and part intellectual tour de force. Weighing in at a staggering 1328 pages, Murakami’s dystopian trilogy 1Q84 features a plot built around a mystical cult and two long-lost lovers who are drawn into a distorted version of reality. At its core, a love story: the tale of Lata - and her mother's - attempts to find her a suitable husband. At the same time, it is the story of India, newly independent and struggling through a time of crisis as a sixth of the world's population faces its first chance to map its own destiny.